Paul Mueller Company manufactures stainless steel tanks, equipment and processing systems for a variety of industries, most significantly the dairy industry. The company was badly hurt by the financial crisis, but is in the midst of a turnaround. The strong success of this turnaround has been obscured by one-time charges and a loss-making division. Despite these positive trends, the company’s balance sheet is weak with high debt and a large pension deficit. For years, Paul Mueller earned steady profits and paid generous dividends. From 1997 to the end of 2008, the company paid annual dividends of $2.40, totaling an astonishing $28.80 per share. The company’s shares rose precipitously, peaking at nearly $70 in August, 2007. However, all was not well. The company’s tradition of paying out nearly all earnings as dividends had left the company dangerously leveraged. In 2007, as profits peaked, the company’s balance sheet showed assets of nearly four times equity. In 2008, Paul Mueller Company purchased its Netherlands-based licensee, taking on significant debt to do so. When the financial crisis struck, Paul Mueller’s suffered the same fate as other over-leveraged, cyclical companies. From the 2007 peak at $241 million, revenues plunged 46% to $130 million in 2010. Earnings per share took an extraordinary dive from $7.74 per share in 2007 to negative $7.50 per share in 2010. Simultaneously, the company’s pension liability blew up. Investment losses lead the net pension liability to increase by nearly $10 million in 2008 alone. With its solvency in doubt, Paul Mueller Company responded by eliminating its dividend and laying off workers. The company also took a serious approach to debt reduction, paying down over $20 million in principal between 2008 and 2011. These steps combined with a recovering economy helped the company back to profitability in 2011. Apparently unsatisfied with the pace of the company’s recovery, the board of directors parted ways with CEO Matthew T. Detelich in early 2011, eventually replacing him with Mr. David T. Moore. Mr. Moore has proceeded to sell non-core assets, such as the company’s restaurant and brewery in Springfield, Missouri. For 2012, the company’s revenues rose 16.5% to nearly $180 million, while profits held steady at near $2 million, or $1.59 per share. That’s the story to this point. At a share price of $18, Paul Mueller Company has a trailing P/E of 11.3. However, this ratio is extremely misleading. In 2012, the company was affected by a number of unusual items that depressed earnings. On a normalized basis, the company’s earnings were much higher. Three major items affected Paul Mueller’s earnings in 2012. First, a decrease in inventory caused a decrease in the LIFO reserved, benefiting gross profit by $227,000. Second, the company settled a compensation with former CEO Matthew T. Detelich for $2.042 million. Lastly, a reduction in a valuation allowance on tax assets of $880,000 helped earnings. 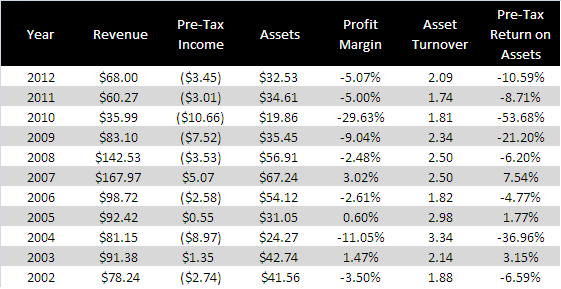 Reversing these unusual items and adjusting for the tax effects of each, Paul Mueller’s normalized earnings are 38% higher than reported, and trailing P/E falls to 8.2. The dairy equipment segment’s revenues and pre-tax profits are up 4.3x and 2.4x since 2002, respectively. A large part of this growth is the result of the acquisition of the company’s European licensee in 2008, but revenues have grown 49.8% since then. Revenue growth has dropped off in recent years, but pre-tax profits have continued to rise. The division was profitable in every year from 2002 to present. Paul Mueller’s dairy division is a gem. The industrial equipment division, on the other hand, is a total disaster. From 2002 to 2012, the segment managed only three profitable years. The profits from these three lonely years were not nearly sufficient to make up for the losses of the many losing years. This is not a cyclical business, it is a bad one. What we have here is consistent losses from a bad business obscuring consistent and growing earnings from a very good business. The good news is Paul Mueller Company has been gradually shifting its focus from its industrial segment to its dairy segment. In 2002, revenues from the dairy segment accounted for 17.8% of total revenues while industrial equipment made up 68.5%. By 2012, dairy equipment had grown to 48.2% of revenues while industrial equipment declined to 37.9%. While the the losses from the industrial segment have lessened in significance, they are still taking a real toll on the company’s profits. Assuming a 35% tax rate, the industrial equipment segment cost shareholders $1.81 per share in 2012, equal to 10% of the company’s share price. Clearly, solving the issues with the industrial segment could deliver a lot of value. In the 2012 annual report, company President David Moore expressed optimism for the industrial equipment division’s largest product line, noting pre-tax losses were reduced by almost $2 million compared to 2011. Perhaps Mr. Moore’s leadership will allow the company to solve its longstanding problems in the industrial equipment division. 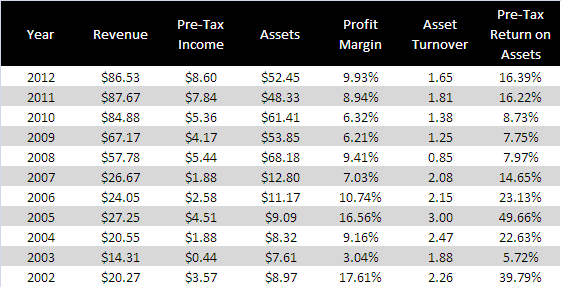 Excluding losses from the industrial equipment division, adjusted for 35% tax, the company would have earned $4.01 per share for a trailing P/E of only 4.5. That’s quite reasonable for a growing manufacturer with a “crown jewel” division. Backing out one time items and the loss-making division reveals huge earnings potential for Paul Mueller Company. 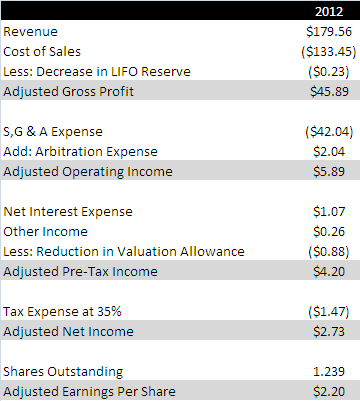 However, this analysis would not be complete without a look at the company’s balance sheet. And unfortunately, it’s not a pretty sight. At year-end, Paul Mueller had shareholders’ equity of negative $1.47 million, net debt of $33.7 million and pension liability of $34.4 million. Ouch! Fortunately, the company also has a hidden asset in the form of a LIFO reserve of $10.7 million. Even with this reserve factored in, the company’s current ratio is only 1.1. The company’s current ratio has historically hovered around 1.0 without any issue, but the ratio still suggests the company’s liquidity is low. Poor liquidity could make both customers and suppliers nervous in an economic down-turn. The company’s debt is quite high at slightly over three times adjusted EBITDA. The company’s pension plan is an even more serious issue. Relative to the size of the company, the plan is huge with $66 million in assets versus a calculated liability of just over $100 million. The plan is frozen for domestic workers, but declining interest rates and falling return expectations have caused the pension deficit to balloon into a serious liability. In 2012 alone, the size of the net liability increased by $7.9 million. At present, the pension plan is allocated 55% to equities and 45% to fixed income and other securities, so the stock market’s performance will have a great impact on the size of the pension liability going forward. Bad stock market performance would greatly increase the size of the liability. Higher interest rates would depress fixed income returns in the short run, but would greatly reduce the long-term pension liability through increased discount rates. Investors must assess whether Paul Mueller Company’s earnings potential outweighs its balance sheet woes. If Paul Mueller Company can reduce its indebtedness, get its pension under control and make progress in the industrial equipment division, its stock could be a spectacular investment. For example, if the company can grow its dairy division at 5% annually and reach break-even in industrial equipment in three years, 2015 earnings per share would be approximately $4.72, assuming all other divisions and corporate costs remain exactly the same. An 8x multiple on these earnings would yield a stock price of $37.77, 110% higher than today. These ifs are big ifs. Another recession could send the pension deficit soaring and stress the company’s ability to service its debt. While I am enticed by Paul Mueller Company’s hidden earnings and successful dairy division, I am staying out until I see evidence of a balance sheet transformation. This company is one to watch from the sidelines, at least for now. hi there, very interesting analysis. i tried to look through public statements or management discussion on MUEL. I eyeballed it (my search function doesn’t seem to work) to see if i could notice any explicit statements by management detailing intentions regarding this turnaround/restructuring in respect of pension liabilities & industrial equip division…alas i couldn’t find anything. Did you see happen to see something i didn’t or perhaps is it possible to somehow ask management what their specific aims/goals are as a way of getting a head start on the wait and see approach? As far as specific plans for restructuring, this is somewhat of a “read between the lines” case. The company’s decision to oust the former president came at a steep cost, so there was probably some pretty serious discontent with his performance. In the 2012 annual report, the new president outlines a number of steps the company is taking to improve performance, including making segment managers more responsible for their own results and improving the sales effort. As for the pension issue, I believe the company is taking a wait and see approach. The recent increase in the size of the liability has been driven mostly by decreases in interest rates. If interest rates rise, a large part of the deficit will take care of itself. At present, the company is only contributing to the plan up to the tax-deductible limit. I believe the company would only increase this amount if the plan become critically under-funded. What are thought on MUEL following the recent two quarters of very good earnings? Definitely reduced risk. The new CEO seems like the real deal. I am encouraged by the company’s reduced debt and expanding margins. The backlog looks good, too. I am much more convinced that the turnaround is real at this point. I can see the balance sheet is improving and the FCF for the year is excellent. Long term debt is now 8.8 million at the beginning of the year, down from 14.4 million. The Annual Report gave current liabilities of 4 million in short term debt and 15 million in short term borrowings. Can you tell me how you figure out how much of this has been serviced this year so I can understand their current debt position? I was using the financing section of the cash flow statement, but this only covers the short and long term debt. What about the short term borrowings of 15 million? How can I know how much is left of that? I have been given the rough answer by someone. Trying to figure out if their FCF covers this easily. It looks a bit tight. Seems like they are dedicating virtually all FCF to debt reduction. Smart. I’m not concerned about FCF covering the short term debt. The company has had no trouble getting credit. I don’t know why I didn’t think of that. You are right, of course they could easily get further financing to cover any temporary shortfall in paying off current debt. Thanks.